Ms Smith branded the funding priorities as "ridiculous"
A Lancashire MP has attacked the way the government makes decisions on the handing out of money from Europe. Geraldine Smith, MP for Morecambe, spoke out after a funding bid to improve the West End area of the town lost out to a circus skills centre in Greater Manchester. Ms Smith said the European Objective Two funding would have been used to tackle the likes of crime prevention. A government spokesman said the bid could be reviewed. 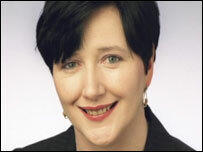 Ms Smith told BBC Radio Lancashire the priorities for allocating the money are "ridiculous", since the West End bid was considered to be last on the list, she claimed. The £3m circus skills centre in Rochdale was at the top of the list, and in response Ms Smith has called for a debate on the way decisions are made. A Government Office spokesman added that if the Morecambe bid could be clarified in a number of places it would be reviewed.